French startup Neural Up demonstrated its incredible relaxation technology in Las Vegas this week at CES. This can be done using headphones and a web based app, or by sitting inside the futuristic Bubble-Zen – where you’re closed off from the rest of the world as the soothing audio experience plays out. It combines sound and visual isolation to put you into a state of deep relaxation. With the headphones on, the audio seems to swirl around your head in a full 360-degree motion. The effect is much like produced by Tibetan singing bowls, though you can choose from all sorts of relaxing musical tracks. ‘It promotes the regulation of the nervous system by activating the body’s natural resources to fight against stress,’ Neural Up says. 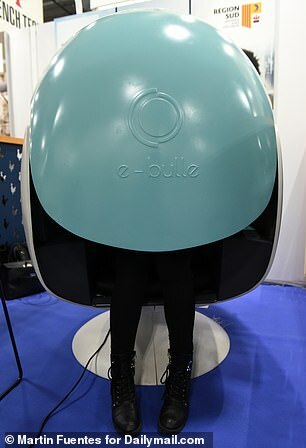 Neural Up had one of its Bubble-Zen pods on display at CES, where attendees and members of the media were able to hop in and tune out for a few minutes in the middle of the hectic convention. 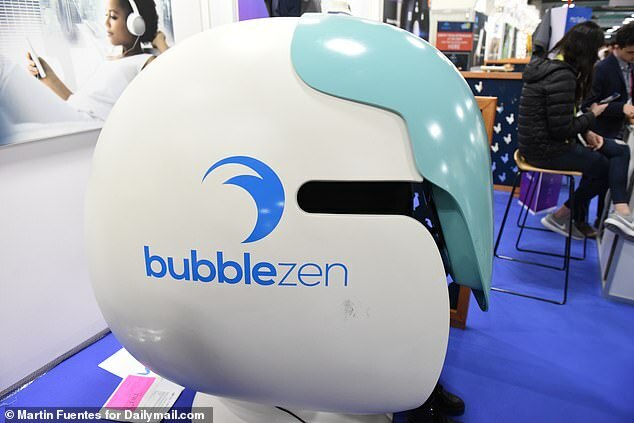 Out in the real world, the firm says Bubble-Zen could find its place in large offices or even airports. The Bubble-Zen team didn’t disclose any specifics on the price, but said it could cost upwards of $15,000, depending on how many are needed for a given space. The system relies on technology developed with neuroscience research in mind, co-founder Gil Borelli told Dailymail.com at CES. It combines sound and visual isolation to put you into a state of deep relaxation, Borelli explained. According to Neural Up, the technology can help to dramatically reduce feelings of anger, fatigue, depression, confusion, and anxiety. The effects, of course, are temporary – but, it’s easy to see how regular use could help to cut down overall stress over time. 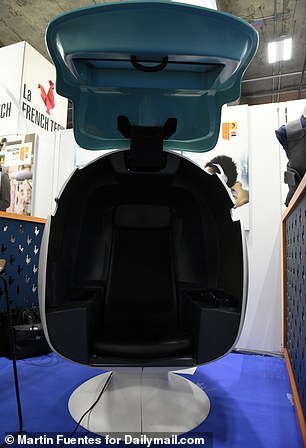 Dailymail.com tested out the immersive relaxation pod at CES and was impressed by how quickly the relaxation sets in – even in such a busy setting. The effect is much like that produced by Tibetan singing bowls, though you can choose from all sorts of relaxing musical tracks, including jazz and classical music. Inside the pod, there’s also an HD touch screen, a microphone and webcam, and LED lights. According to Neural Up, the system simply works by boosting processes already happening in your own brain. Neural Up’s technology will soon be available for mobile and tablet, along with the Bubble Zen version.